I don’t know about you, but I always enjoy diving into “best books” lists to see if I can spot an old favorite. Or find a new one. And when I discover that a book authored by yours truly is on the list, well, how fun is that? And in this case, the treat is twice as nice! For this week Nutriciously.com posted their The 40+ Best Vegan Books You Must Get Your Hands On In 2017. And both The Plant-Based Journey and The Mindful Vegan made the list! The rest of this top 40 (actually 42) list contains works by some of my favorite authors – Melanie Joy (Why We Love Dogs, Eat Pigs, and Wear Cows), Michael Greger (How Not to Die), T. Colin Campbell (The China Study), Neal Barnard (The Cheese Trap) Brenda Davis (Becoming Vegan), Angela Liddon (Oh She Glows Cookbook), Kim Campbell (The Plant Pure Kitchen), Dreena Burton (Plant-Powered Families)- and that’s just for starters. It’s easier just to jump over to the Top 40 page and take a look for yourself. Maybe you’ll recognize an old favorite or find a new one yourself. Click HERE to see the entire list of Top Vegan Books for 2017. Included, you will find a brief description and review of each book, along with pictures of their covers. Thank you Nutriciously for this spectacular honor! Which of these 40 books make YOUR “best” list? And which would you add? Please, comment in replies below as I’d love to hear all about it! 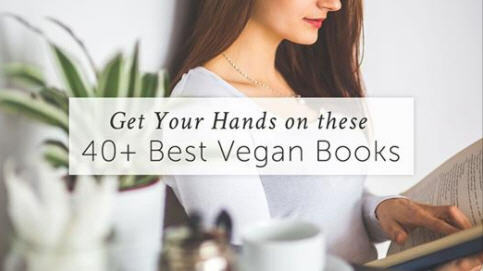 While this list can’t contain ALL the wonderful Vegan books out there, I am very concerned as a long time coach in the Vegan Living Program that you have not included many more C’books, esp. ones that offer Whole Food, Plant Based w’little on no added oils. Some of these books here are little more than picture books w’little to no REAL assistance on how to maintain a Healthy Plant Based in REAL time. Many people now days have little or no experience in cooking for themselves AND are working a full day, then feel they need an hour in the gym, and of yes need to take the kids to soccer practice! While K. Campbell and FOK books are very important, these books they are filled w’numerous ingredient make a meal for 6 – 8 recipes and NO suggestions as to how maintain healthy home cooked meals during the work/school week. The absence of Lindsay Nixon’s “Happy Herbivore” books seems to me to be a very short sighted mistake. During the Vegan Living Program we ask ‘Pledges’ to commit to VEGAN FOR ONE MONTH and during that month we give them weekly 3+hour classes and a ‘Coach’ to assist them w’questions, shopping trips, cooking assist, etc. This time is NOT the time for long, involved, huge amount recipes. Going Vegan should not be making simple cooking seem so difficult. PLEASE do check out Lindsay Nixon’s 5 C’books, all of them except for the Holiday one are what I refer to as the 30 min. Rachel Ray of PBWFNO cooking and supply people trying to machete transition w’EASY + QUICK way to transition. Please note that this is not a list that I created, I am simply sharing the wonderful work of Nutritiously.com. Everyone has their own opinion of course, and I am very grateful for this honor. In the meantime, I am not familiar with the Vegan Living Program. Feel free to email me at lani@lanimuelrath.com with more information. What a great list! Many of my favorites are on it, and it has given me some new ideas too. I like reading the short reviews and personalized perspective. Thanks for sharing this Lani and congrats on making this list with your wonderful books – twice! Gentry, I found several favorites on this list as well! And like you, got some great reminders on important titles. Thanks for your kind words and for stopping by to share your thoughts!